Available at Authorized Epiphone Retailers beginning in November 2017. 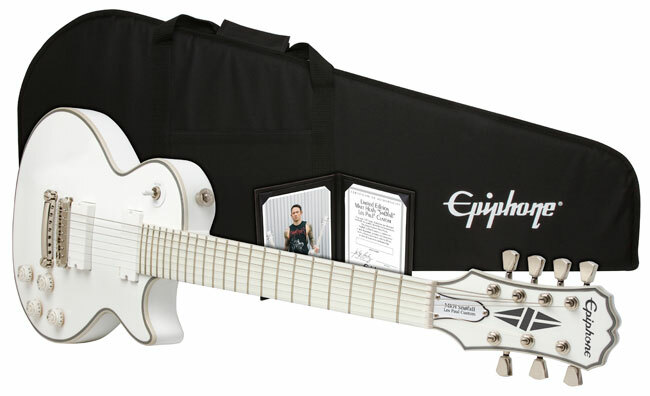 Epiphone Signature Artist Matt Heafy of Trivium is back with the new Ltd. Ed. 6 and 7-string "Sn∅fall" Les Paul Custom Outfits, Heafy's second series of custom Les Pauls, this time in inspired by Trivium's critically acclaimed album Silence in the Snow. 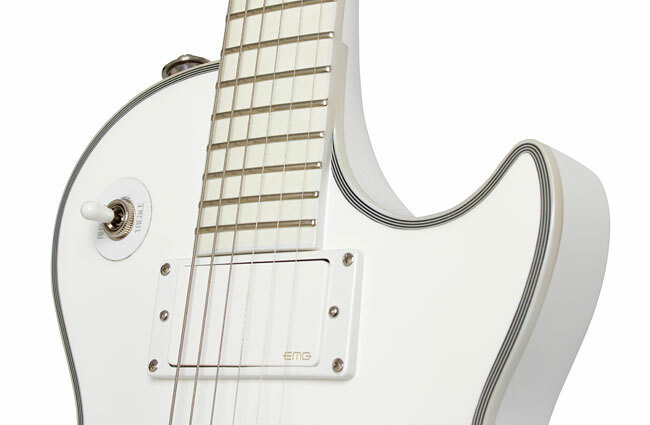 As usual, Heafy brings a new twist to the classic Les Paul Custom design with a beautiful Alpine White Gloss finish, Phenolic fingerboard, and EMG active pickups. Plus, both 6 and 7-string Ltd. Ed "Sn∅fall" Les Pauls include a premium gigbag and a hand-signed Certificate of Authenticity. 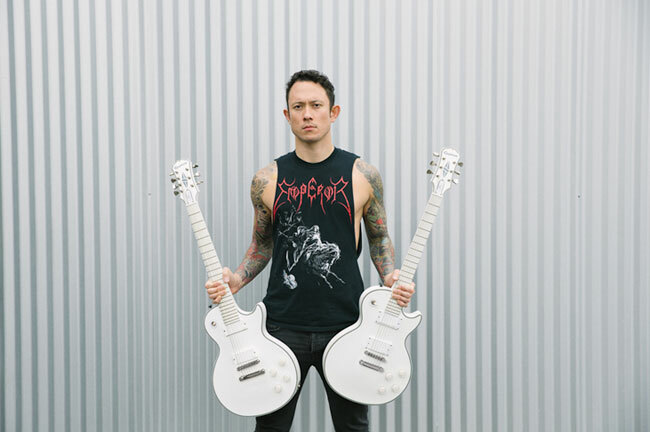 "The idea for these guitars started back when we made the 'Silence in the Snow' video," Heafy told Epiphone.com. "We had the original MKH prototypes and we knew we wanted to so do something that was dramatic. So we decided to completely cover them in white paint because the record was Silence in the Snow. It looked really cool. I remember mentioning them to (Epiphone President) Jim Rosenberg that maybe we could do these guitars in a different paint job. About three months ago, Jim surprised me and said 'Hey I just sent some guitars to your house.' And the next thing I knew, there was this new MKH color --I was totally blown away by it. We have to do this! So we kept it a secret but at the same time we also recorded the new record with them. I used no other guitars during the sessions--strictly Epiphone MKH models. Then we brought the white guitars on tour so we kind of let the guitar out of the bag really early. I just couldn't wait. 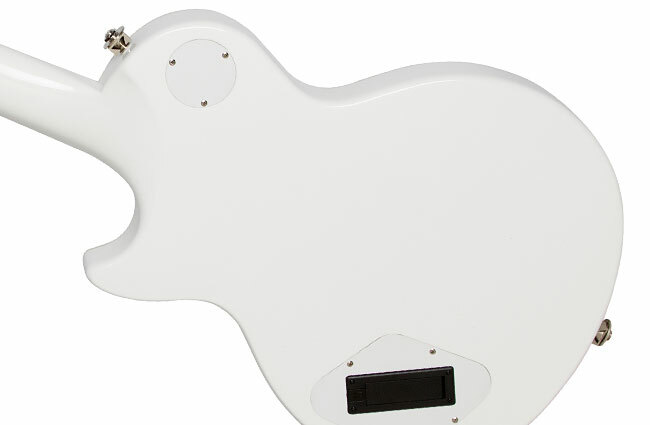 When I brought out the white guitars, the kids seemed really stoked at those so that was cool." Both the 6-and 7-string Matt Heafy's Ltd. Ed. "Sn∅fall" Les Paul Customs have a Mahogany body with a Plain Maple Veneer top in a beautiful Alpine White Gloss finish. 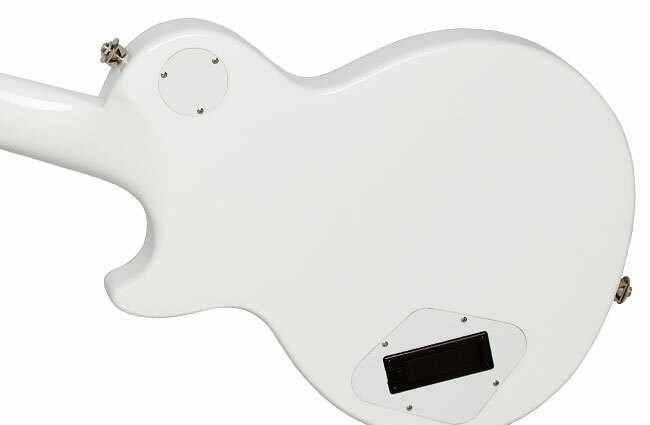 The body has black and white layered binding as does the "clipped ear" headstock. The Mahogany neck has a 1960's SlimTaper™ "D" profile and is glued to the body with a deep-set neck joint with "Axcess" heel for smooth upper fret access. The Phenolic fingerboard has a 24.75" scale length, a 12" radius, and 22 medium jumbo frets. 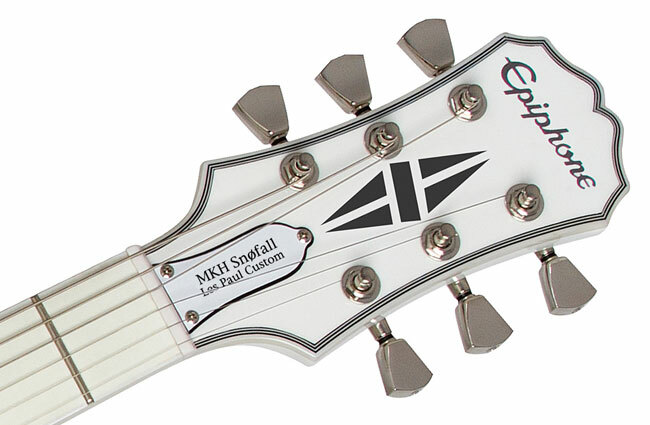 The adjustable truss rod has a white and black cover with "MKH Les Paul Custom" in black silkprint and Epiphone's classic 60s era logo in pearloid along with the traditional Les Paul Custom "split diamond" design. The Ltd. Ed. 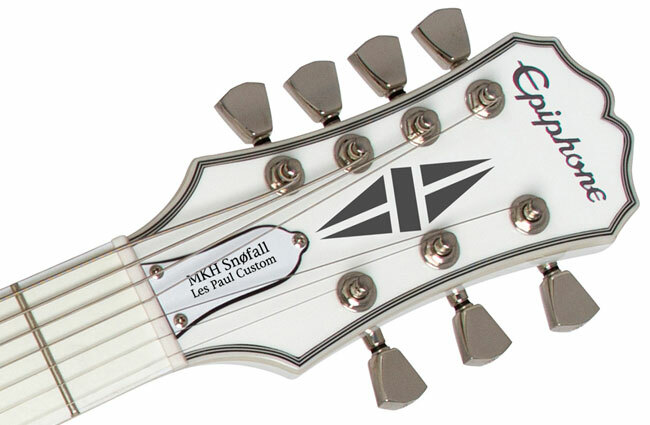 Sn∅falls also feature Heafy's favorite active EMG pickups. The 6-string Sn∅fall comes with an EMG-81 in the lead position that utilizes powerful ceramic magnets and close aperture coils for detailed intensity, incredible amounts of high end cut, and fluid sustain. 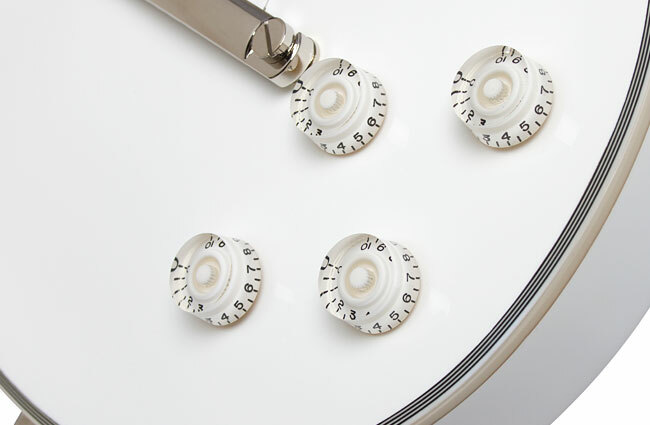 In the neck position is an EMG-85 featuring Alnico-V magnets for a slightly more rounded tone. The classic combination of an EMG 81 with an EMG 85 in a Les Paul Custom offers metal guitarists an incredible array of extreme possibilities. 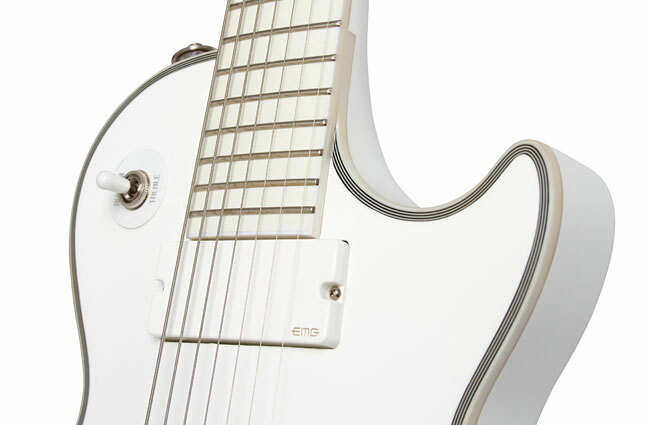 The Sn∅fall 7-string uses an EMG-81-7 and an EMG-707 in the neck position. First introduced in 2001, the EMG 707 was designed to eliminate the common problem of a "muddy" or cloudy-sounding low B-string. 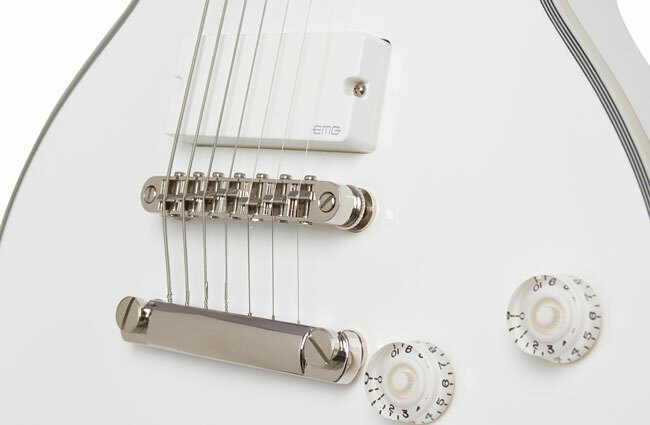 The EMG 707 features Alnico V magnets with wide aperture coils to bring up the low B string tone while maintaining a balanced and articulate upper register. 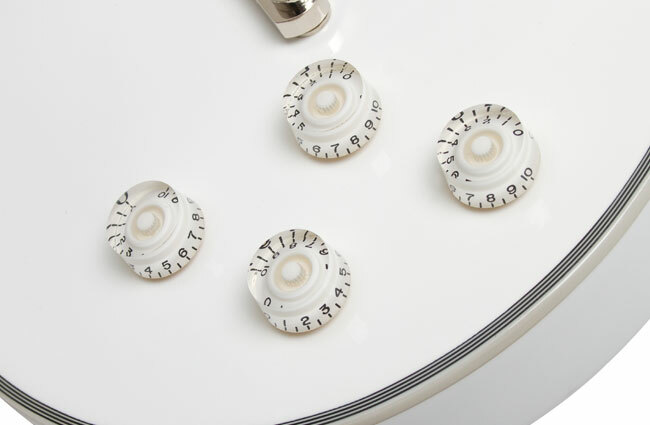 Epiphone's no-compromise electronics include a 1/4" non-rotating output jack and volume and tone controls with White Speed Knobs powered by full-size 500K Ω potentiometers. 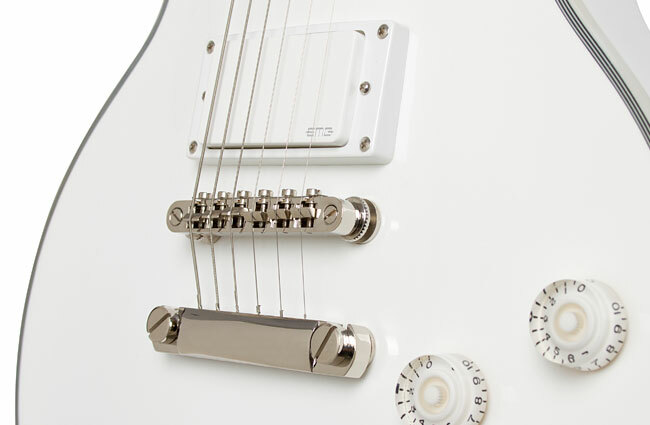 The pickup switch is Epiphone's all-metal 3-way pickup selector with a white toggle cap. An easy-access 9V battery compartment can be found on the back of the guitar. Each Ltd. Ed. "Sn∅fall" comes with 'Trivium' proof hardware including nickel 14:1 ratio Deluxe Diecast machine heads with metal Tulip Buttons, Epiphone strap locks, a LockTone™ Tune-o-matic (or Tune-o-matic-7) bridge and Stopbar tailpiece combo, and an Epiphone Heavy-Duty 1/4" output jack with metal jack plate. Both the 6 and 7-string "Sn∅fall" models include a premium gigbag and Certificate of Authenticity. During the Silence In the Snow tour, not only did fans get a sneak peak at Heafy's new Epiphones, fan club members got to hear working versions of songs from the upcoming album, Sin and the Sentence (due October 20, 2017). "On tour, we previewed the new album for some of the Trivium fan clubs that have popped up--Japan, Portugal. We'd play the songs at soundcheck and ask them what they thought. So there were people that got to hear the stuff about 8 or 9 months ago when it was still in a rough form. We knew then we were onto something good." Heafy said that over the years, Trivium has thrived by providing the band members and open environment where anyone can contribute to arrangements. "We actually started writing some of the earliest songs for the Sin and the Sentence before Silence in the Snow came out," said Heafy. "And it seems to be the kind of way we've been doing things the last couple of records. We'll just release a record and then start working on the next one. Not because we're told to. Not because we think we need to. We just feel inspired to. We love Silence in the Snow but it definitely landed on the extreme end of Trivium. We do really well when we're just feeling it. We don't have a set formula for the way we write nor do we have any set group of people that do tinges for us. We said going into this record that this has to be the best record Trivium has ever made or basically what's the point? Can we even survive if we don't make the best record we've ever made. All that matters is we have the best stuff that comes out." "I think it's hard to give someone a Trivium record and say 'this is what we are.' We try to make each record a little bit different. But I think the Sin and the Sentence is a good bookend to everything we've ever done. It's like a summary of records one through seven all on one record. I feel like we can hand this to a new person who doesn't know Trivium or an old fan." Visit Trivium's website for tour info and see your Authorized Epiphone Dealer to check out the new Ltd. Ed. "Sn∅fall" Les Paul Custom Outfit 6 and 7-string models. Neck Joint: Glued In, Deep-Set Neck Joint w/ "Axcess Heel"